Let me pose a question to you – what is the shape of a grape? What is the first thing that comes to mind? I would bet that most you are thinking things like round, oval, circular, etc. Would you be surprised to hear the answer : “shaped like a finger?” If you haven’t seen what Grapery out of Bakersfield, California is up to (you may remember them from their Cotton Candy grapes) then I am here to introduce to a grape that is shaped like a finger, and not just any finger – a Witch Finger. Are you intrigued? Witch Fingers or Chili Pepper Grapes? 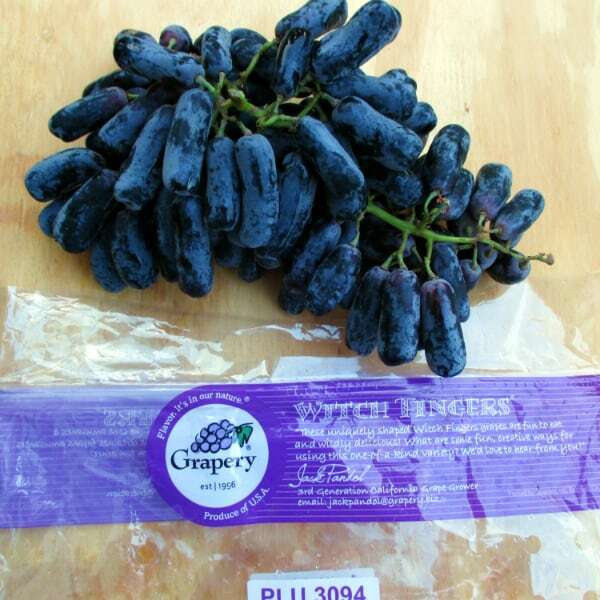 The first Witch Fingers grapes were released in 2011. I first heard about them in 2012. I had to wait for my first bite until 2013. Long before that, the Grapery had been developing these strange shaped grapes. Originally they were going by the name Chili Pepper Grapes. They do resemble the shape of some chile peppers, particularly the Thai Chile. Sounds pretty reasonable to me. However, marketing Chili pepper grapes to children probably would not work so well. Plus, I can imagine customers approaching produce stockers with questions about whether the grapes were spicy or not (you may laugh but trust me, after years working in the produce business I have heard it all). As the Grapery was sampling them, people started saying that they look like Witch Fingers and thus Witch Fingers were born! Why should I care about a funny shaped grape? There are several reasons to care. The grapes have a texture unlike any other grape you have had before. The skin to flesh ratio is different which gives them a certain snap like no other grape available. The flavor itself is outstanding. The taste is similar to what you have had before, just turned up a few notches. Put it all together and Grapery has a hit on their hands. Let’s not take for granted the challenges that had to be overcome to get Witch Fingers into the bag and into our mouths. Jim Beagle, CEO of Grapery, said that they are his hardest varieties to grow. The biggest challenge is something called shatter. This is when the grape detaches easily from the stem. When you buy a bag of grapes you will often find loose ones in the bottom of the bag. The greater the tendency of a grape to fall off the vine, the more you will find in the bottom of the bag and those are the grapes that tend to go bad quickly. This is why remove these grapes when I buy a bag, so I don’t waste my money. Witch Fingers’ tendency to shatter reduces their shelf life. Witch Fingers are also more susceptible to heat and wind damage. Factor all these things in and it can be hard to reach levels of production that will be economical for Grapery. At first I only knew about the one variety of Witch Finger – a small, red grape. I recently discovered that there is more than one variety out there. I picked up a bag of Witch Fingers that were much larger in size, were black in color, and had a blunt end, instead of a point. The texture on these grapes were just as amazing as the original red one but in a different delicious way. They do not look as much like a pointy witch’s finger however the feedback Grapery received from customers is that they were indeed Witch Fingers, so they rolled with it. They have other varieties in the works that are not yet available, including a green variety you can see in this video from a ABC30 news report. The green one is still a few more years away from being commercially ready. Will Witch Finger Grapes Be Available for Halloween? 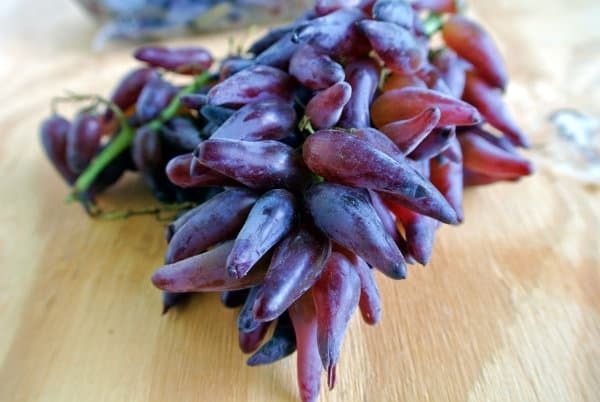 Witch Fingers grape sound like the perfect addition to your Halloween party. Who wouldn’t want to attend a party with these grapes featured on a platter? It’s marketing genius. However trouble is they aren’t available that late in the year. Grapery is developing other Witch Fingers varieties that will ripen at different times. How cool would it be to walk into your local grocery store and see a big display of Witch Fingers grapes amongst all the bags of not-so-good-for-you candy? There is hope that one variety will be available later in the year for your Halloween party or Trick or Treaters, but it’s going to take some time before than can become a reality. When are Witch Fingers Grape Available? The current season runs from around July 20th to September 20th. I picked up smaller red variety in late July and the larger black variety in early September. These were the only two varieties of Witch Fingers available in 2014. I think the unpainted black ones look more like cocktail weenies! I can’t eat anything witchy.